Energy • Beehive State funnels $53 million to four counties to invest in an Oakland, Calif., port where fossil fuels will be shipped to Asia, Latin America. Francisco Kjolseth | The Salt Lake Tribune Crews move coal at the Levan transfer facility along Interstate 15 south of Nephi where a steady flow of trucks unload it before it is transferred to train cars. Utah's Community Impact Board has awarded a $53 million loan to four coal-producing counties to invest in a deep-water port in Oakland, Calif. hoping to connect central Utah commodities with export markets. Bowie Resource Partners already exports about 1 to 3 million tons of coal from its Utah mines. FILE - A deep water port is under development at the former Oakland Army Base, pictured here in 2008 at the foot of the San Francisco Bay Bridge. 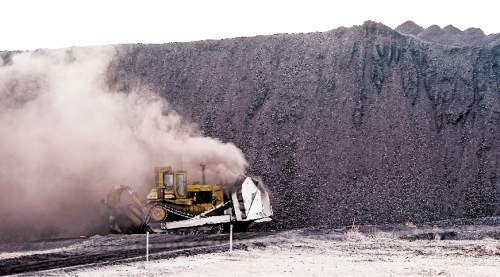 Utah has loaned four coal-producing counties $53 million to buy into the project to guarantee export throughput for coal and other commodities produced in central Utah. But coal shipments might not be welcome in Oakland. 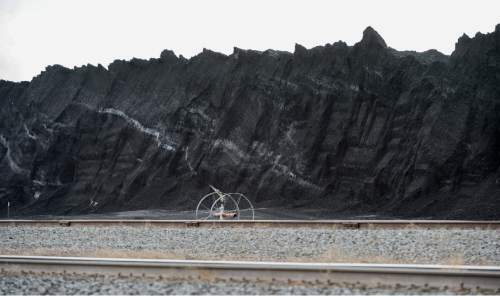 (AP Photo/Bay Area News Group, Laura A. Oda) Moving coal Rail moves much of the 18 million tons of coal Utah produces each year. This map shows the location of Union Pacific rail lines, spurs and load outs relative to coal mines in Emery, Carbon and Sevier counties. Most of Utah's coal used to be burned in California and Nevada power plants, but most now stays in Utah as the domestic market dries up. 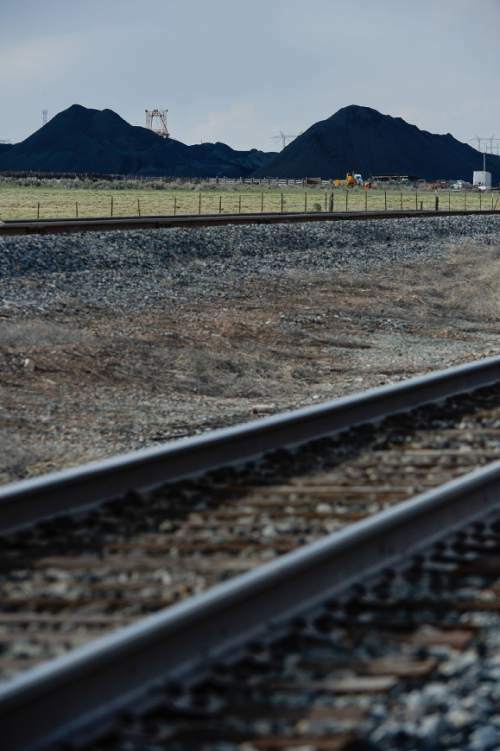 Officials hope deals with Bay Area export terminals will open overseas markets for coal and other commodities mined or growth in central Utah. Francisco Kjolseth | The Salt Lake Tribune Coal trucked from central Utah piles up at the Levan transfer station south of Nephi, where it is loaded on Union Pacific freight cars bound for California. Utah's Community Impact Board has awarded a $53 million loan to four coal-producing counties to invest in a deep-water port in Oakland, Calif. hoping to connect central Utah commodities with export markets. Bowie Resource Partners already exports about 1 to 3 million tons of coal from its Utah mines. Francisco Kjolseth | The Salt Lake Tribune Coal trucked from central Utah piles up at the Levan transfer station south of Nephi, where it is loaded on Union Pacific freight cars bound for California. Utah's Community Impact Board has awarded a $53 million loan to four coal-producing counties to invest in a deep-water port in Oakland, Calif. hoping to connect central Utah commodities with export markets. Bowie Resource Partners already exports about 1 to 3 million tons of coal from its Utah mines. Francisco Kjolseth | The Salt Lake Tribune Coal trucked from central Utah piles up at the Levan transfer station south of Nephi, where it is loaded on Union Pacific freight cars bound for California. Utah's Community Impact Board has awarded a $53 million loan to four coal-producing counties to invest in a deep-water port in Oakland, Calif. hoping to connect central Utah commodities with export markets. Bowie Resource Partners already exports about 1 to 3 million tons of coal from its Utah mines. Francisco Kjolseth | The Salt Lake Tribune Coal trucked from central Utah piles up at the Levan transfer station south of Nephi, where it is loaded on Union Pacific freight cars bound for California. Utah's Community Impact Board has awarded a $53 million loan to four coal-producing counties to invest in a deep-water port in Oakland, Calif. hoping to connect central Utah commodities with export markets. Bowie Resource Partners already exports about 1 to 3 million tons of coal from its Utah mines. Francisco Kjolseth | The Salt Lake Tribune Coal trucked from central Utah piles up at the Levan transfer station south of Nephi, where it is loaded on Union Pacific freight cars bound for California. Utah's Community Impact Board has awarded a $53 million loan to four coal-producing counties to invest in a deep-water port in Oakland, Calif. hoping to connect central Utah commodities with export markets. Bowie Resource Partners already exports about 1 to 3 million tons of coal from its Utah mines. Francisco Kjolseth | The Salt Lake Tribune Coal trucked from central Utah piles up at the Levan transfer station south of Nephi, where it is loaded on Union Pacific freight cars bound for California. Utah's Community Impact Board has awarded a $53 million loan to four coal-producing counties to invest in a deep-water port in Oakland, Calif. hoping to connect central Utah commodities with export markets. Bowie Resource Partners already exports about 1 to 3 million tons of coal from its Utah mines. 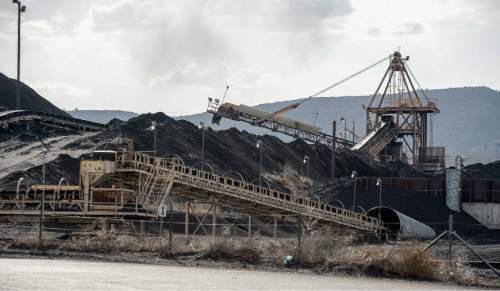 Francisco Kjolseth | The Salt Lake Tribune Coal trucked from central Utah piles up at the Levan transfer station south of Nephi, where it is loaded on Union Pacific freight cars bound for California. Utah's Community Impact Board has awarded a $53 million loan to four coal-producing counties to invest in a deep-water port in Oakland, Calif. hoping to connect central Utah commodities with export markets. Bowie Resource Partners already exports about 1 to 3 million tons of coal from its Utah mines. Francisco Kjolseth | The Salt Lake Tribune Crews move coal at the Levan transfer facility along Interstate 15 south of Nephi where a steady flow of trucks unload it before it is transferred to train cars. Utah's Community Impact Board has awarded a $53 million loan to four coal-producing counties to invest in a deep-water port in Oakland, Calif. hoping to connect central Utah commodities with export markets. Bowie Resource Partners already exports about 1 to 3 million tons of coal from its Utah mines. Francisco Kjolseth | The Salt Lake Tribune Cows graze the pastures adjacent to the Levan transfer facility along Interstate 15 south of Nephi. Coal trucked from central Utah piles up at the Levan transfer station south of Nephi, where it is loaded on Union Pacific freight cars bound for California. Utah's Community Impact Board has awarded a $53 million loan to four coal-producing counties to invest in a deep-water port in Oakland, Calif. hoping to connect central Utah commodities with export markets. Bowie Resource Partners already exports about 1 to 3 million tons of coal from its Utah mines. Francisco Kjolseth | The Salt Lake Tribune Coal trucked from central Utah piles up at the Levan transfer station south of Nephi, where it is loaded on Union Pacific freight cars bound for California. 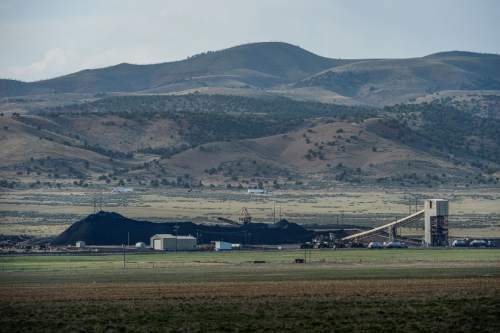 Utah's Community Impact Board has awarded a $53 million loan to four coal-producing counties to invest in a deep-water port in Oakland, Calif. hoping to connect central Utah commodities with export markets. Bowie Resource Partners already exports about 1 to 3 million tons of coal from its Utah mines. Francisco Kjolseth | The Salt Lake Tribune Coal trucked from central Utah piles up at the Levan transfer station south of Nephi, where it is loaded on Union Pacific freight cars bound for California. Utah's Community Impact Board has awarded a $53 million loan to four coal-producing counties to invest in a deep-water port in Oakland, Calif. hoping to connect central Utah commodities with export markets. Bowie Resource Partners already exports about 1 to 3 million tons of coal from its Utah mines. Utah wants to get into the coal-exporting business. To do that, the state intends to invest $53 million in a new deep-water port in Oakland, Calif., in a bid to guarantee ship-loading rights for coal and other central Utah products that will be sent abroad  to Asia and Latin America. But pulling off the deal could prove more controversial than Utah bargained for. Coal may be the official state rock, but it is a commodity non grata in California&apos;s Bay Area. And some Utahns wonder whether building infrastructure two states away is an appropriate use of money earmarked for mitigating the impacts of mineral extraction in rural Utah counties. 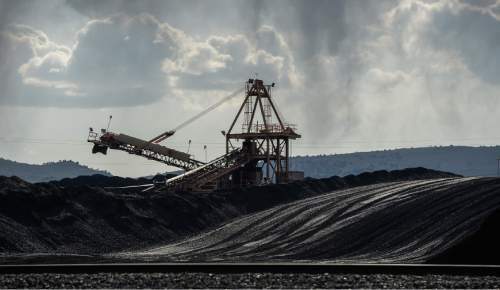 Earlier this month, a state board that controls how millions in federal mineral royalties are spent on local projects approved lending the money to four coal-producing counties  Carbon, Emery, Sevier and Sanpete. With domestic demand for coal declining as natural gas becomes the fuel of choice for generating power, many see Asian markets as the best hope for ensuring the survival of central Utah&apos;s coal industry. "This is an opportunity that will bring about an ability to open markets and gain an international presence we&apos;ve never had as rural counties," Carbon County Commissioner Jae Potter told colleagues on the Permanent Community Impact Fund Board (CIB). "For our economy to grow outside the Wasatch Front, it will take this type of investment. "This guarantees decades of jobs throughout the state, not just Carbon County," he added. "This is a one-time opportunity. This will not come back to us in five years." Potter&apos;s rural county and three others  home to most of Utah&apos;s remaining coal mines  want to buy into the Oakland Global Trade and Logistics Center, a port complex being built on the former Oakland Army Base at the foot of the Bay Bridge. If all goes as planned, Utah&apos;s overseas coal shipments could start as soon as 2017. The investment marks the first time community-impact funds would be spent on a project outside Utah. Bigger slice of a bigger pie • Utah leaders stress that coal would not be the only Utah commodity to move through the new port. Alfalfa, grain, potash, salt and iron ore also could be shipped by rail to Oakland Global for export, according to CIB Chairman Gordon Walker. "What we are doing is creating through-put for other commodities that are coming online. Potash is going to be a big deal," Walker said, referring to the proposed Potash Ridge mine in Beaver County. "This benefits all of rural Utah. We have created a bigger pie." But the four counties involved in the deal don&apos;t produce potash or much else for export, other than alfalfa and salt. They do account for nearly all of Utah&apos;s coal production. Last year, Utah&apos;s eight coal mines produced nearly 18 million tons valued at about $600 million. That&apos;s down from a peak of 27 million tons in 2001, but still an unexpected uptick from the previous year, according to the Utah Geological Survey. Many of the plants that produce California&apos;s power are moving from Utah&apos;s coal to natural gas. The Intermountain Power Plant near Delta, for example, is expected to convert in the next decade, snuffing out 5 million tons of annual demand. 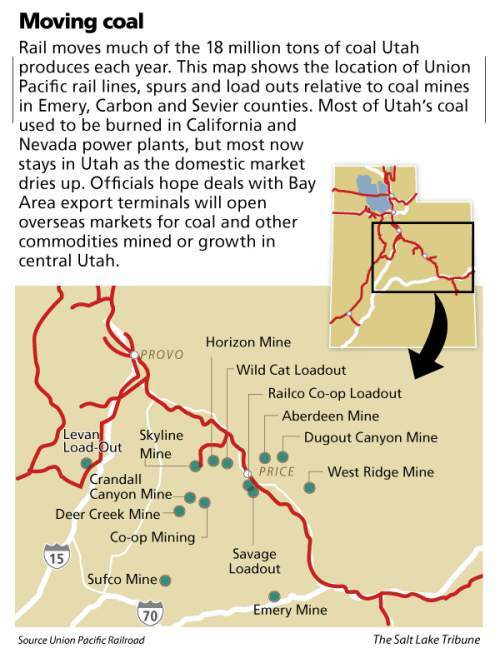 In the early 2000s, California and Nevada were big customers for Utah coal. By last year, the two states bought only 2 million tons. 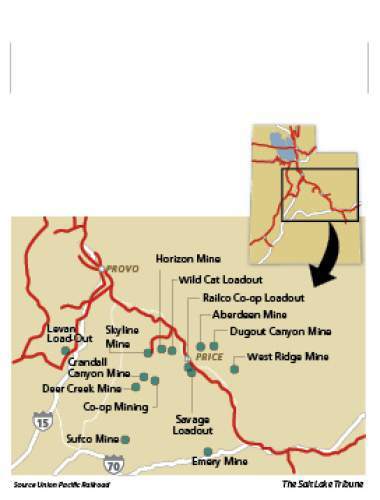 It is no mystery why Bowie Resources secured export-loading contracts when it bought Arch Coal&apos;s three Utah mines in 2013. Dugout Canyon, Skyline and Sufco, the state&apos;s largest, account for about two-thirds of Utah&apos;s coal production. During the past three years, Bowie has shipped 1 million to 3 million tons a year to Asia and Latin America out of the Stockton and Levin-Richmond ports near the Bay Area and at Long Beach in Southern California, according to Grant Quasha, Bowie&apos;s chief commercial officer. But, he said, the company is not taking part in Utah&apos;s deal with Oakland Global. Despite those established export streams, Bowie&apos;s transport path highlights the complexity of shipping coal. Inland ports such as Stockton are not ideal. Shallow water makes it difficult to load large cargo vessels all the way to the top with heavy coal. And the upriver location requires an extra three days to reach the open Pacific Ocean, according to Walker. By comparison, Oakland has the minimum 52 feet of water needed for the largest vessels and is within sight of the Golden Gate Bridge. King coal dethroned • But Oakland and its environmentally active populace pose a different problem. 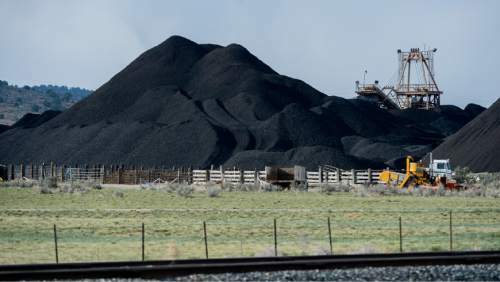 Advocates of Utah&apos;s coal-export plan never mentioned the intense opposition coal exports face on the West Coast at that April 2 CIB meeting in Salt Lake City. The Sierra Club&apos;s Cesia Kearns and others are busy fighting proposals to ship Western coal from ports up and down the Pacific coast. Much of the activism has focused in the Northwest, where Wyoming is investing heavily in export-loading operations. 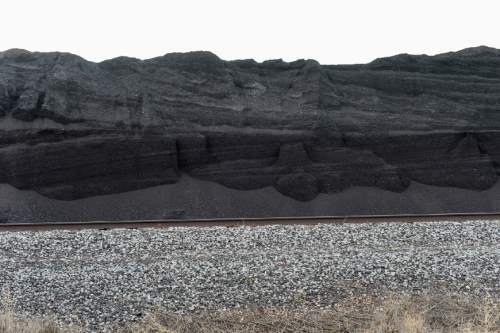 Two proposed ports in Washington would connect long "unit" trains  exclusively carrying coal from a transfer station to a port  with huge cargo ships at export docks that would handle nearly 100 million tons a year of Powder River Basin coal. "This is not the kind of proposal that would affect a small group of people," said Kearns, who is based in Portland and co-directs Sierra Club&apos;s Power Past Coal Campaign. "It affects people from the coal fields and every town along the rail lines that would have a dramatic increase in coal trains going through, and the ports themselves." It&apos;s not just environmental activists raising concerns. 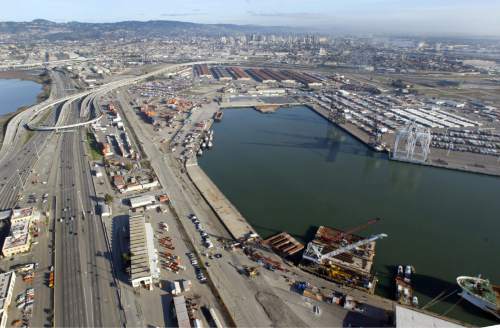 Bowie last year proposed building a coal-loading dock at the Port of Oakland&apos;s Howard Terminal. But port commissioners turned down the project, noting that coal shipping does not square with its environmental-stewardship policies. Oakland&apos;s city policy seeks to encourage divestment in fossil fuels and opposes shipment of such fuels through the East Bay city. A resolution passed last June by the City Council highlighted the dangers of moving crude by rail, but also called out coal dust. "Each coal car in a 125-car coal train loses, on average, 500 pounds of coal per car in transit, for a total of up to 60,000 pounds lost per train on an average trip," the resolution states. "Uncovered rail cars contaminate cities, towns, farmland, forestland, streams and rivers across California with coal dust, petcoke and chunks of coal." Council President Lynette McElhaney, whose district includes the old Army base, has seen how industrial pollution can harm west Oakland, her racially diverse neighborhood that experiences high rates of asthma. Any coal-shipping proposal would get close scrutiny, according to McElhaney&apos;s spokeswoman Casey Farmer. "This is progressive community that expects our ports to be leading the way forward to a sustainable future," Farmer said. McElhaney also is concerned about the potential of hazardous rail shipments disrupting the Port of Oakland if there is a spill or derailment. Nationally, activists worry that exporting U.S. coal would reverse progress in reducing reliance on coal for power generation. Coal not only emits more pollution than any other fuel source and produces mountains of ash when burned, but it also releases twice as much climate-altering carbon dioxide than natural gas per unit of power generated. Jeremy Nichols, energy program director of WildEarth Guardians, questions the wisdom of Utah counties such as Emery and Sevier clinging to a resource that the rest of the nation is abandoning. "The industry is struggling to remain viable, but the trend is clear. It is incredibly risky to be taking taxpayer dollars and putting them in coal futures. That is not where our prosperity lies," Nichols said. "These counties are misreading the situation. I know they are proud of their coal deposits and want to extract every dollar of value out of them. But these deposits are increasingly becoming a liability, especially as carbon costs become truly integrated into our economy." Nichols&apos; group and the Sierra Club seek to limit coal mining in Utah. WildEarth Guardians is protesting the Forest Service&apos;s approval to lease the Greens Hollow tract adjacent to the Sufco Mine. Bowie wants to tap that 56 million-ton deposit to ensure the future of Utah&apos;s oldest coal mine. Project still on track • Despite those trends, the four Utah counties are plowing forward with their piece of the California project. Jeff Holt, chairman of the Utah Transportation Commission, pitched the port investment to the CIB as a consultant for the four counties. The project is a public-private partnership between Oakland, which owns the land, and California Capital & Investment Group, which is acting as master developer for the project area&apos;s northern half. A 30-acre piece is devoted to transloading bulk freight  including Utah&apos;s future coal shipments  from rail to boat, according to Holt. Oakland boasts the closest deep water to Utah. Two major rail carriers, Union Pacific and Burlington Northern Santa Fe, connect Utah to the major port destination on the eastern shore of the San Francisco Bay. Containerized shipping currently monopolizes the adjacent Port of Oakland. "It&apos;s great for competition," said Holt, who recently led a delegation of Utah CIB members to inspect the site. "You can see why it&apos;s not used for containers. Only bulk will work here." About $500 million already has been spent preparing the land, which has been used as a staging area for Bay Bridge reconstruction in recent years. Now, $275 million is needed to build the wharf facilities, which have to be tailored to specific commodities to prevent cross-contamination, according to developer Phil Tagami. "It&apos;s a multi-commodity terminal. There are only a dozen on the coast," Tagami said. "I don&apos;t control the markets, but we respect the fact there is demand for a wide array of products. We don&apos;t tell the shipper or the cargo owner what they should or shouldn&apos;t ship." Terminal Logistics Solutions is the company that will build and operate the project through a 66-year lease with the city. "We are very proud the state of Utah and these four counties have shown an interest of making an investment in our terminal," said TLS President Jerry Bridges, a former Port of Oakland director. "It bodes well for the future of Utah. We think it is a positive move." Questions remain • The terms of Utah&apos;s involvement have yet to be determined. Bridges stresses that any commodity shipped to the port, whether or not it&apos;s coal, would come in covered rail cars and be processed in enclosed facilities. "We&apos;re looking at every commodity out there," Bridges said. "The terminal will evaluate all the products that can pass through. There has been no commitment for any particular product or particular volume." But resident Margaret Gordon, a former port commissioner who co-directs West Oakland Environmental Indicators Project, sees too many unanswered questions. "They will not clarify how they will move stuff through the neighborhoods. What kinds of trains? How often will the trains come? Will they be storing coal here? That was the problem with the Howard Terminal," Gordon said. "There is a growing concern about the dangers about bringing fossil fuels though the community that is already being impacted. How are they going to protect the community? We have no idea." Oakland Global is designed to move 9 million metric tons a year, but it can operate most efficiently at 6 million to 7 million tons. The amount of shipping volume reserved for Utah products is under negotiation. The Utah counties&apos; CIB loan is to be paid back over 30 years at 2 percent, beginning when the project starts moving freight in mid-2017. 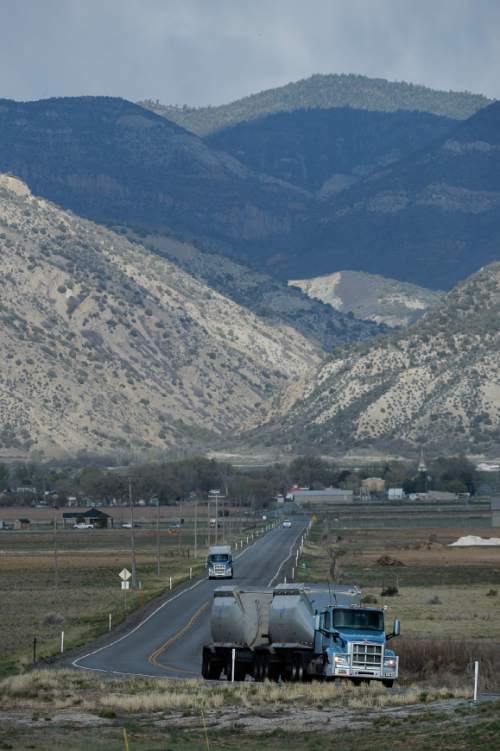 Holt&apos;s pitch earlier this month failed to sway two CIB members from the Uinta Basin, the heart of Utah&apos;s oil country, which is struggling with its own commodity-transportation woes. "How many county commissioners want to obligate their counties should this not work?" asked Uintah County Commissioner Mike McKee. "Let&apos;s say you&apos;re losing $10 million or $20 million. Who&apos;s going to be on the hook for that money? Is the CIB going to take that risk?" In the end, McKee&apos;s argument about the potential risks proved unsuccessful. Meanwhile, Holt has briefed Utah Gov. Gary Herbert, who was "very supportive." The governor&apos;s office, which has no say in how CIB money is spent, agreed the loan can grow central Utah&apos;s economy. "Utah is a landlocked state, but we are big on exports," spokesman Marty Carpenter said. "The idea is to also move potash, grains, alfalfa, iron ore, salt and soda ash. If you can connect our state to get these materials into the marketplace, that has a benefit for these rural communities."